While we were on our holiday in the New Forest in July, we took a few days before we decided to go to the beach. We filled the days with other activities in the Forest itself, which were really good, but the beach day was looming. 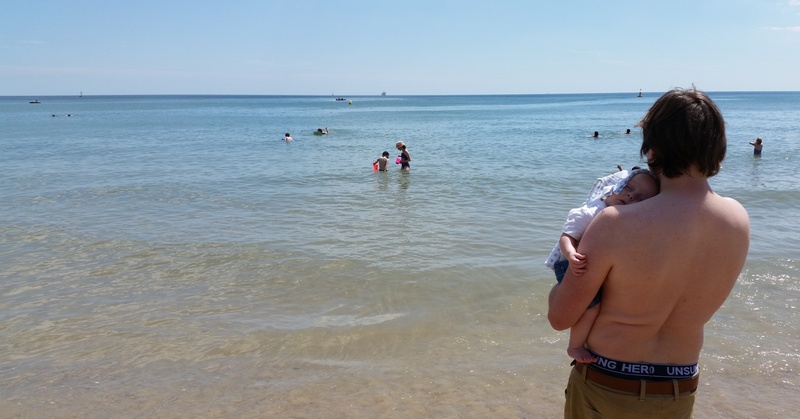 We knew we wanted to do it, we had to for our children, but as I’ve mentioned before, the beach was one of Abi’s favourite places, so it was something that made us feel on edge. We went to Branksome Beach. It was so hot so it was very busy and we’d not really brought much with us other than costumes and towels, so I quickly bought a few mats and a parasol from the beach-side shop. It was one of the most beautiful beaches I’d seen, perfect golden sand and crystal clear water, but I struggled to enjoy it. I went to the shore with my son and looked out to sea. It seemed like the edge of heaven. I was thinking of Abi, taken back to only 2012 where she played happily with her brother and sister on the shore at Shanklin, Isle of Wight. I wanted to scream at the sky, yet my son skipped happily about in the foam. The children enjoyed collecting shells, digging holes and jumping the waves, that was why we were here. To make memories for them. But I felt kind of panicked. I couldn’t relate to my hubby. We were so distant that day. I couldn’t vocalise my feelings, especially in front of the children. I felt guilty for this glorious day. I felt the loss of Abi, as I saw other girls her age. I felt the loss for her siblings, who have lost their fun playmate. Despite the crowds, the noise and busyness, her absence deafened me like never before. I was chatting with my daughter and holding the baby when an angelic-looking girl, blonde hair, blue eyes, came running over. She was about 13. She had a body board in her hand and asked us, my daughter, if she wanted it as she’d just bought a new one and didn’t need it anymore. There was nothing wrong with this board, she just wanted to give it away. I think I stared at her for some time before I replied. I was thinking – Abi, what? why? She stayed there patiently waiting for me to respond. She didn’t just skip off and give it to the next person like you might think. I gabbled a bit, unsure what to say. We accepted with thanks and she ran back to her dad and they left the beach (I noticed that they didn’t have a new body board with them). I felt something. Something just happened. There were many families around us, closer in proximity to her, yet she chose us. Of course, this girl reminded me of Abi, not really in looks but in age and character. I smiled a little as I felt we had been sent a message. A message that it was okay to be here, that we should enjoy it, that my anxious daughter should try and do something a bit new and try out the board. I can’t deny that I felt my loss more deeply, but I was also comforted by this young stranger’s ‘simple’ act of generosity. 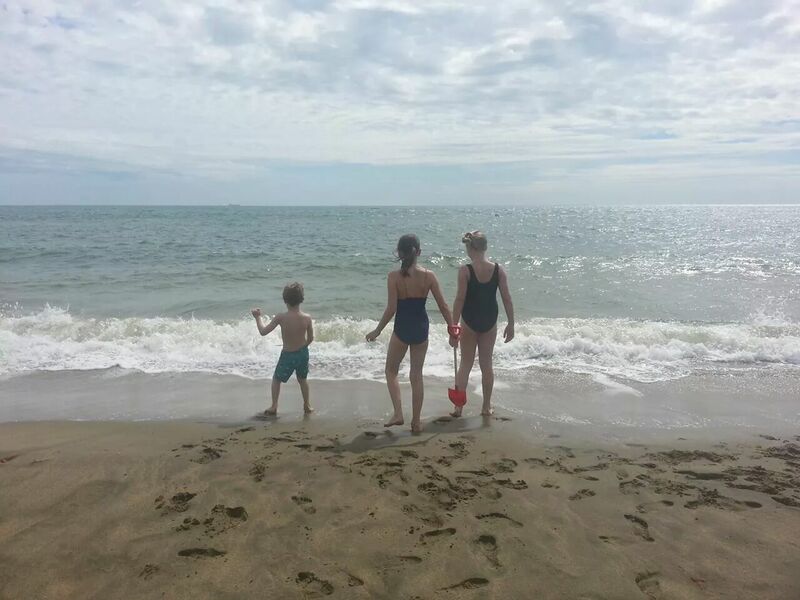 We finished our day at the beach – I say we ‘survived it’ – but there was a sense of achievement, that we’d done something hard and, while beaches will always bring Abi closer to us, next time it won’t be so difficult. But most of all, I’ll never forget that little angel who visited us that day. And then there are gestures from people who empathise with our loss and want to help in some way. When we got back to our holiday home, I was feeling subdued, emotionally deflated. My phone pinged and I had a message from a company I’d bought a mobile phone cover from. I had tweeted about how much I loved my new phone case, which had a picture of Abi on it. They wanted to give me my money back, just because! I was dumbfounded. There was no need for them to do that at all and no suggestion of anything other than a gesture of goodwill. I knew the company didn’t want any fuss; what they did wasn’t about money or fame, even so, I have written a review of this company and the product. This entry was posted in Faith and tagged angel, bereavement, child loss, Death, family, grief, holiday by Chasing Dragonflies. Bookmark the permalink. I’m a firm believer in the universe sending signs. Glad to read about the goodwill of people at random, but I’m sure Abi is sending a little sunshine your way. 🙂 Beautiful post. What a beautiful story. I try desperately on some days, to find those signs and messages, but the pain is still too great. Thank you for showing that there is a side to grief that doesn’t lead to constant devastation. Wishing you peaceful days.